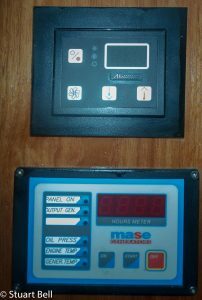 Boats, and all mechanical devices, require maintenance. It is easier to figure out the what and how to fix on a boat than, for example, a relationship. 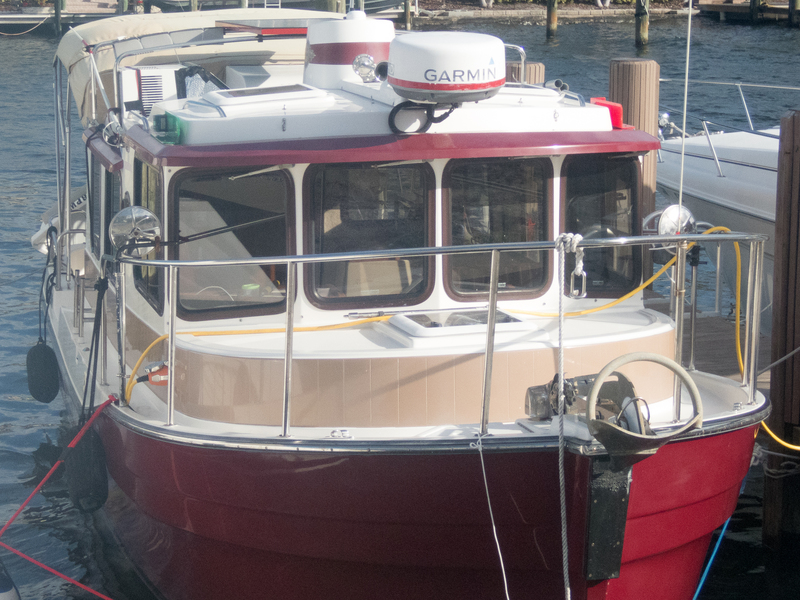 Shearwater IV, back in her home slip after bottom paint, detailing, waxing, and cleaning. 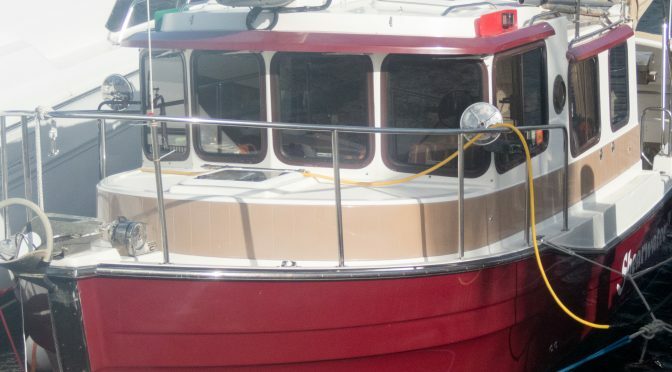 On a boat, if it touches the water, bottom paint it. If it is metal, protect it, if it once shined, clean and shine it, and if none of these are true, replace it. Joan had an ample supply of good taste and selected the colors and patterns used in the refurbishment. 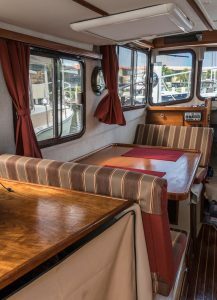 She also interviewed a number of boat canvas companies looking for excellent quality, comfortable discussions and the ability to complete the job while the boat was out of the water for bottom painting and polishing. 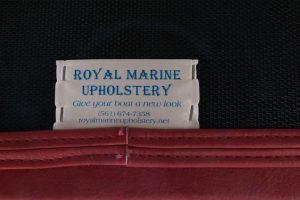 Royal Marine Upholstery did an absolutely beautiful job of making us new drapes out of a low light transmission Sunbrella so we could sleep past first light. The drapes are also longer and wider than the originals, so they fit into one another. 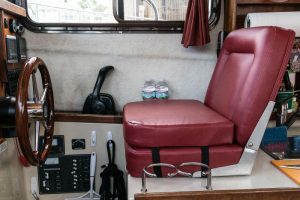 The overall flavor and feeling of the Shearwater improved significantly with the new upholstery. 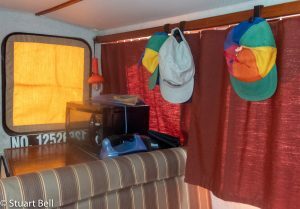 The drapes were extended full length and width to better control light entering early in the morning. 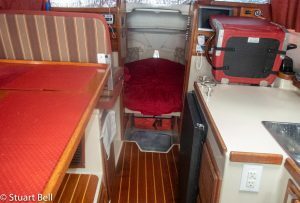 The colors of the wood, seat coverings, and draperies were better coordinated. 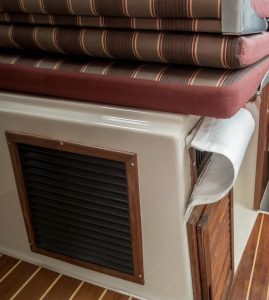 Taste goes a long way when redecorating a boat. 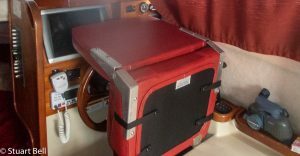 New Admiral’s Chair – folds front and rear. The new seats are a repeating pattern that only a true expert can fit. The pattern in the front and rear seat line up. 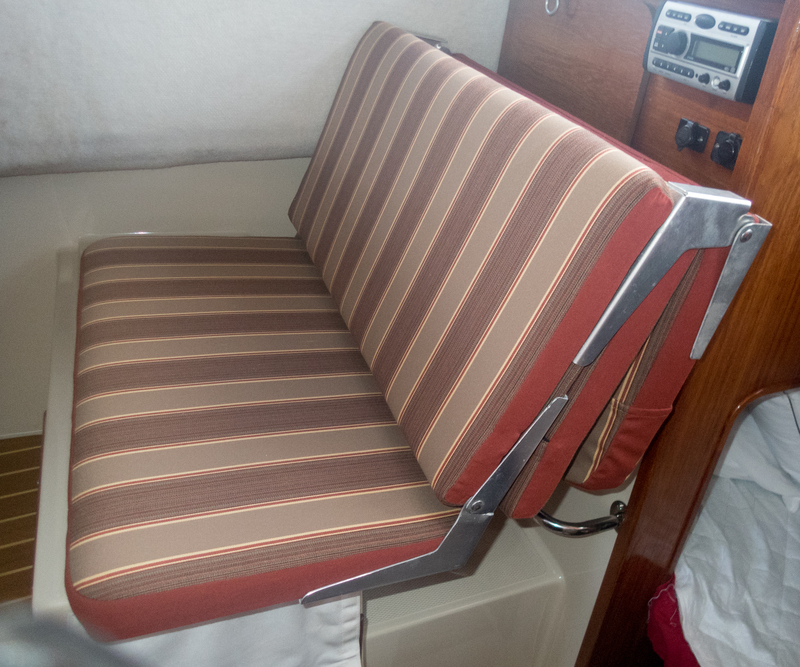 As do the slip covers they made for the tops of both seat backs – areas that were starting to show wear on the older upholstery. The Captain’s chair was a challenge. It had to fold forward to provide extra counter space, clear the steering wheel, and be somewhat elevated above the design height so I could comfortably see out the front windows since I am short. They managed all this while making the seat more comfortable than it was when new. 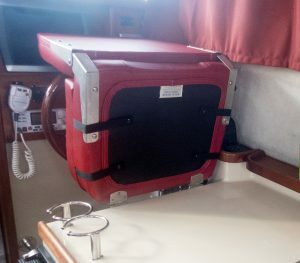 The Cockpit originally had a small storage area with a small bait tank. 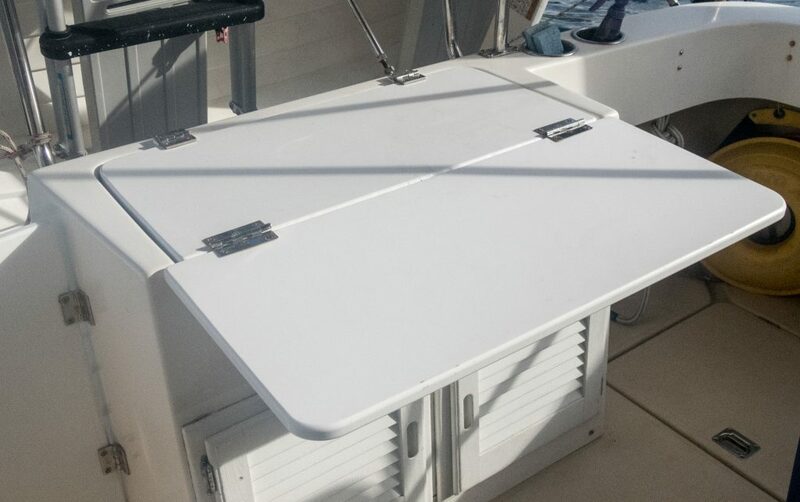 It was covered with Starboard to provide a place to cut fish. 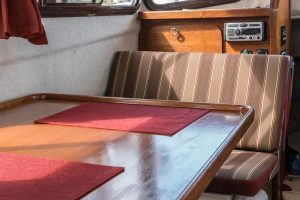 We added a second sheet of Starboard, a leg, and some polish to make a small, comfortable dining area. 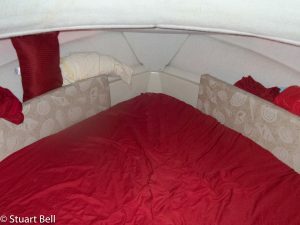 view forward showing V berth entrance and ample storage under. Green tie covers overboard pumpout.